Here is one of my latest creations. 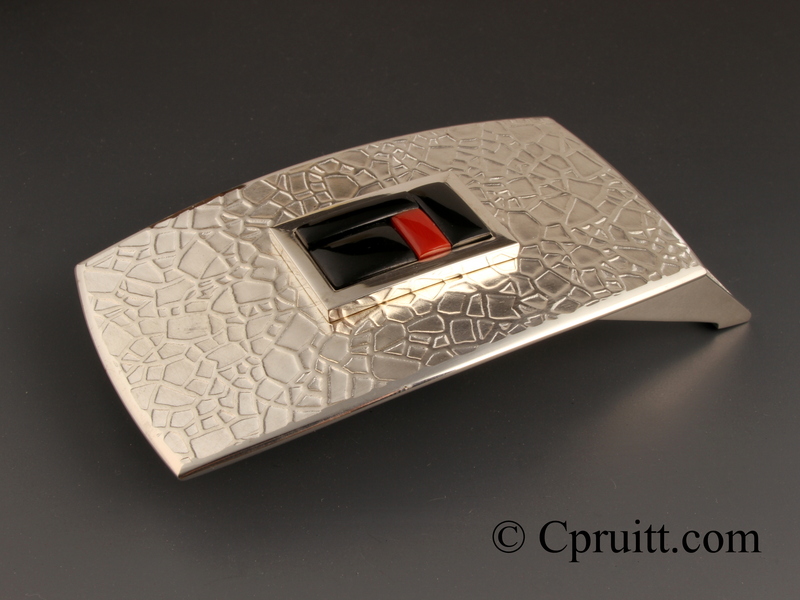 A Contemporary Belt buckle consisting of sterling silver, Black Jade and Coral. The “Spyderweb” texture on the silver is unique, all components of the buckle are hand fabricated and asselmbeled by myself. Texturing is done by placing a patterning medium ( canvas, screen, manila folder etc.) with a piece of annealed silver and putting it through a rolling mill, transferring the pattern onto the metal. Brighter results are achieved by pre polishing the silver prior to rolling. It is currently for sale in the Shop Buckles Section with further information and extra pictures. This entry was posted in New designs and tagged belt buckle, Black Jade, buckle, Chris, Chris Pruitt, contemporary, Coral, Inlay, jewelry, New Mexico, printing, Pruitt, silver, spyder web, spyderweb, sterling, sterling silver, textured by cpj1. Bookmark the permalink.